Cryo electron tomography (cryoET) is an enabling technique for structural studies of molecular machines either in vitro or in situ. During the last five years the performance in terms of resolution and applicability cryoET has been enormous due to the game changing technologies that transformed the application of cryoEM in general. 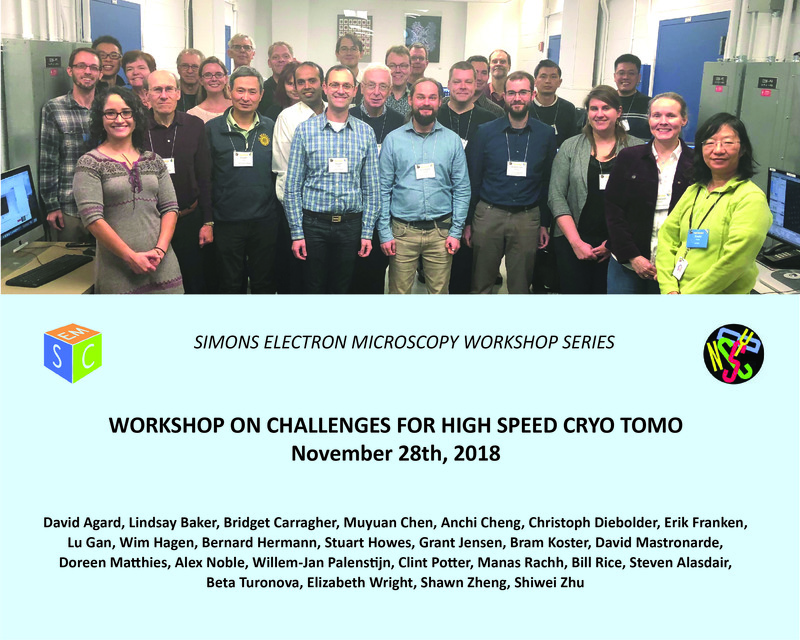 The emergence of highly sensitive and faster detectors with electron counting capability, improved properties for prolonged and automated cryoEM data collection sessions, and optimized software and hardware for single particle analysis has resulted in mature and reasonably high throughput workflows for cryoEM. In contrast to the cryoEM workflow, existing cryoET workflows are low throughput. The purpose of the workshop was to discuss the challenges and opportunities for high speed cryoET. We focused on understanding current workflows for cryoET, identifying the most critical bottlenecks related to quality and throughput, and proposing future work to address these bottlenecks. Aspects discussed included: (i) Goniometers: eccentricity, stability, speed, repeatability, continuous tilting; (ii) Automation; (iii) Cameras: delivery and recovery speed, acquisition modes; (iii) Novel strategies: dose rate, step size; phase plates; (iv) Image formation of highly tilted specimens; (v) Preprocessing; (vi) Need for dedicated hardware and software. We thank Thermo Fisher Scientific for their support of this workshop. The Agenda is below. The workshop was webcast to YouTube and the content of the first day is available here and the second day here. PDF versions of slides that have been made available by the speakers can be found by following the links attached to the speakers’s names in the agenda below.